The Avengers all unite on this bounce house! Captain America, Iron Man, Hulk, General Nick Fury, Thor, Hawk Eye and The Black Widow are here to save your party! This heroic crew will set the theme for any backyard party. Children will love the huge bouncing area (225 square feet) with basketball goal inside! Got Bounce? 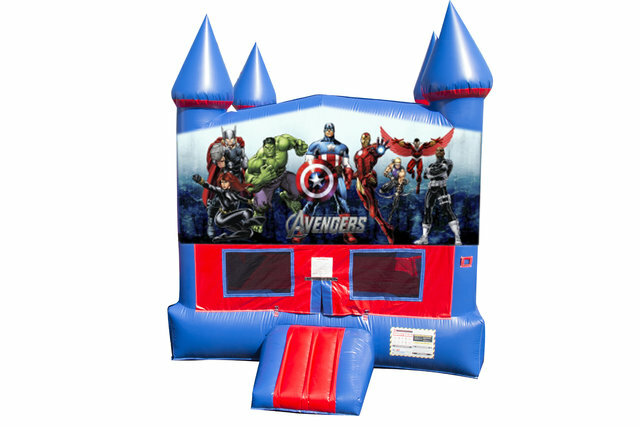 The Bouncing Buddies Avengers Bounce House is great for family entertainment, providing the most popular form of amusement for children. Bouncing also puts you in a state of health and fitness, improves your sense of balance, creates an aerobic effect for your heart, strengthens your muscles, and increases the capacity for respiration, resulting in better mental performance!